Hey guys. 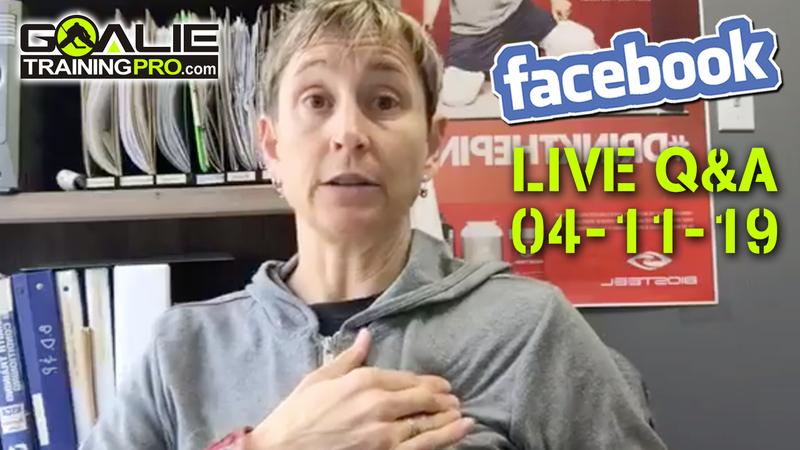 It’s Maria here from Goalie Training Pro TV, this is episode number 43 and we’re talking about dynamic warmup today. The topic is the three exercises. There are three exercises I want you to include in your dynamic warmup. And I know some of you are like, “Dynamic warm…? What is this dynamic warm-up of which you speak?” So, for those of you just do these three exercises. I think you’re gonna feel better on the ice. I know that you don’t have time to warm up on the ice, or when you do have time to warm up on the ice, it’s really just trying to move your face out of the way of like slappers that everyone is just taking right at your mask. So, it’s not really exactly the kind of warmup you need. The best case scenario would be that you do this at the rink somewhere and I made it specifically so you don’t have to lie on the floor ’cause I know that’s gross. But you could do it at the rink somewhere, just in your long johns and your t-shirt or whatever. Then you can go put your gear on and then go on the ice. You don’t need to send me and email telling me how you can’t do that because da, da, da, da, da, and you don’t get to the rink and you just have time to change and I get it, I totally understand. If you had to do it at home, and then drive to the rink, and then put on your gear and go on the ice, that’s okay too. Like everything – there’s good, better, best. So, it’d still be better to do it at home then drive to the rink then put on your gear and go than to not do it at all. Best is right before you put on your gear. Then someone’s gonna email me and be like, “But I live an hour from the rink. Should I still do it?” Yeah. That would be good. … if you live four hours from the rink, probably don’t bother. And then someone else is gonna say, “You said in your dynamic warmup that we should do this and this and this too.” Yes. You should. Your dynamic warmup, really, if you do a full dynamic warmup, it’ll take you 20 minutes. 15, 20 minutes. I’m just giving you … Like, this is just the reader’s digest version. If you’re not doing anything or if you do something, hey, add these three and see the difference that it makes. A full dynamic warmup includes lots of other stuff than this. So, don’t get the idea that like, “No, Maria said we just have to do these three exercises and that’s all.” It’s not. But this is like, this is like the Swiss Army Knife. It’s not perfect at anything but it’s better than nothing. (And I’m a fan of the Swiss Army Knife, I’m not trying to diss the Swiss Army Knife. Let’s just get that straight). So, here’s the first one. We’re gonna work a little of core stability and a little bit of hip stability because you guys discount how much you need to balance just on one knee. Just from your hip. And also, you’re not actually very good at it because you never practice it. So, for this one, we’re going to start on our knees and stabilize on one hip. We’re gonna lift the other knee and try to get it as high as our belly button and then hold it for three seconds. So, on the side that I’m lifting my knee, I’m actually activating my deep hip flexor, or a muscle called my iliopsoas, which is one that I actually need when I bring my knee up to recover my skate if I’m gonna do a lateral push from my butterfly. But then on the other side, you might have a little of swervin’ Mervin going on. I’m working to stabilize it and I’m bracing with my abdominals to integrate that trunk control. So, you’ll do four on each side. You’ll stay up nice and tall. If you are super wobbly … That doesn’t count. You gotta stay nice and tall and just bring that knee up trying to get as high as your belly button. Four on each side. You’ll hold for three seconds. Then we do want to warm up up your adductors and your groins. But again, remembering that, hey our muscles work in chains. So, a lot of times when you see goalies get injured it’s not just that they just kick their skate out and tore their groin, often they’ve kicked their stake out and then the puck’s gone the other way and they’ve reached this way, or it’s been some kind of a compound movement. So, you’re gonna stand up, you’re gonna step out, getting a nice stretch in your groin. So, one knee’s gonna be straight and one a little bent – getting a nice stretch. You’re gonna rotate away on the side with your bent knee. Stretch your arm out, following your hand with your head. Then you’re gonna come back the other way, following your hand with your head. Again, another nice stretch there. And then you’ll just push back up to standing position. And then go back starting the other way first. So, come down, back, and then I’ll push back up. So, you really don’t need a lot of space. You can just do it back and forth. And you’ll do about four each way like that. And then for the last one, it’s gonna be a little knee recovery. You don’t need to get in our butterfly for this. It’s just, you want to get that leg recovery and a quick lateral push. So, you’ll start on your knee and it’s just gonna be a nice knee recovery, lateral push. But then stick it. So again, working on this stability through your hip and your torso to stick that landing. And hold it for about three seconds and then you’ll come back down. Nice strong torso, good position, so not sitting back. Thinking, “Hey, I’m gonna lead with my head and my shoulders.” So you can lead and then stick that landing. Notice if you’re staying nice and low and loaded in my leg. So, I’m just reinforcing some good habits. Turning on some muscles I’m gonna need. Adding some length to a few patterns that I’m gonna use on the ice. That whole thing will take you maximum of three minutes. Not even three minutes. I know. I know how it is. 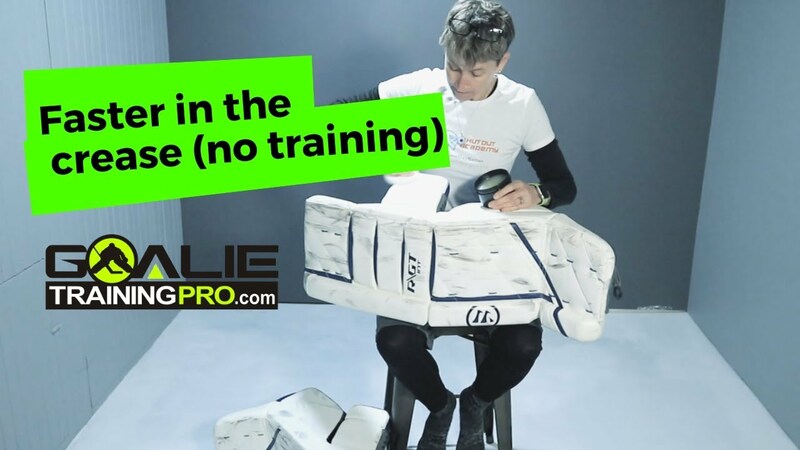 I’m Maria from Goalie Training Pro TV. I will catch you next time. Bye-bye.